Preheat the oven to 425°F. Line a baking sheet with parchment or a nonstick liner, and set aside. To prepare the fries, begin by blanching the green beans. Submerge them in boiling water for 2 – 3 minutes until they are bright green but still a bit crisp. Immediately transfer the green beans to a bowl of ice water to stop the cooking process. Then, lay them out on a clean towel and pat them dry. Set up the three breading stations in three shallow bowls. Place the flour in the first bowl and the eggs in the second bowl. In the third bowl, combine the bread crumbs, onion powder, and cayenne pepper. Season all three bowls with salt and pepper, and give each one a quick whisk to make sure the seasonings are evenly incorporated. Dip the green beans first in the flour, shaking off any excess, and then in the egg. Then, toss the green beans in the bread crumbs to coat evenly and transfer to the prepared baking sheet. Be sure to place the green beans in a single layer, leaving some space between them so that they bake evenly and get nice and crunchy. 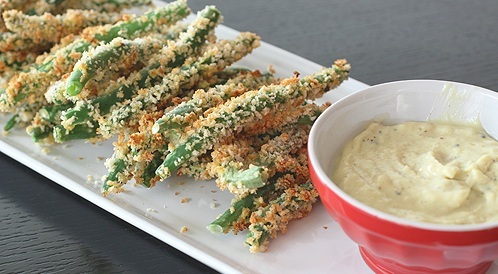 Bake the green bean fries for about 15 minutes, until golden and crisp. Meanwhile, prepare the dipping sauce. Wisk together the roasted garlic paste, mayonnaise, olive oil, and Dijon mustard. Season to taste with salt and pepper. Serve the fries immediately with the dipping sauce on the side.